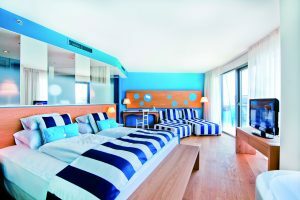 Modern five-star design style hotel built in 2011 and situated on the shores of the Mediterranean a 20-minute drive from the City of Zadar. Iadera is a year-round destination and can be what you want it to be; a quick change of scenery – it’s just a couple of hours away from the UK, an active adventure holiday, a spa retreat for those needing a bit of pampering or a complete detox. Whatever the reason there’s a choice of great dining, modern and comfy bedrooms and lots of space to lose yourself. 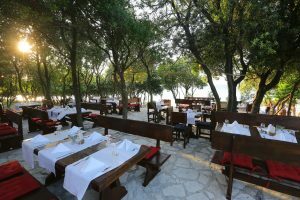 Easiest is to fly to Zadar (30-minute drive from Iadera) with flights from Luton, Stanstead & Manchester. Alternatively, Split (a 55-minute drive) has flights from most of the UK including Heathrow in the summer. Perfect for couples looking for natural surroundings in which to explore, or lounge by the pool or in the 6,000sq m. Spa. Families are welcome, and children can visit Falky-Land, the children’s activity centre at the nearby hotel Diada. Spread over 6,000sq m the spa caters to your every need from simple sauna to in-depth healthe highlight. The Aquapura concept is to bring your body into tune with the four seasons by reflecting and supporting your natural biorhythms. 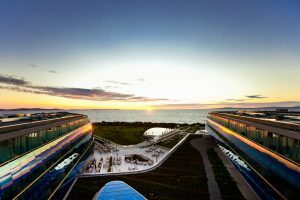 Iadera was built in 2011 and is designed in an unusual ‘S’ shape with creative use of blue glass for the balcony walls. The bedrooms and suites are spread over 3 floors. 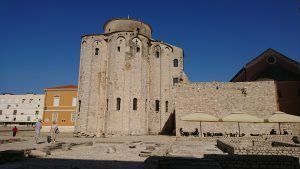 The city of Zadar is a 20-minute ride away. The old city can trace its roots to pre-Roman days and the architecture is a clash (all in the best possible taste) of Roman forums and Tito’s emphatic post 1945 socialist blockism. This is definitely worth a visit not least because you’ll leave without feeling you’ve missed 3 museums. Wander through the ancient gates and into the cool narrow streets lined with stylish boutiques, cafes and convenience stores. There are wares laid out for browsing and purchase but there are no hard sell tactics on display. Indeed, there are no hawkers or people pressuring you into anything you don’t want to do. Renew the ancient art of writing postcards (to carry home in your luggage or left at reception in hope of a speedy dispatch) under a shady umbrella in one of the town’s squares. The sea organ is as curious as it is random, but the opportunity to stroll along the waterfront gazing at the islands so close across the water to find it makes the experience well worthwhile. Paklenica National Park is a short drive away from the hotel and with its dramatic canyons, forests and wildlife it offers ideal walking and hiking for all abilities. Tours and guided walks can be arranged but the bold can hire a car and plot their own course. The Water, this is the Mediterranean so from small boats, sailing to exploring using the regular ferries to assorted islands there is no excuse to miss out. What makes this so enticing is that the entire coastline here is protected by a chain of islands, some with great beaches, that creates the impression of an inland lake, so you could be in the Lakes.